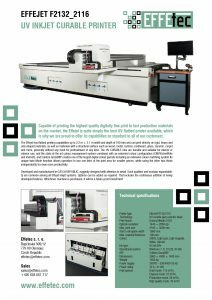 Leaflet of new UV digital flatbet printer Effejet F2132/F2116 - Effetec s.r.o. Capable of printing the highest quality digitally fine print to fast production materials on the market, the Effejet is quite simply the best UV flatbed printer available, which is why we are proud to offer its capabilities as standard to all of our customers. Caldera GrandRIP creates one of the largest digital colour gamuts including an extensive colour matching systém.Its unique twin Mode function allows operators to use one-third of the print area for smaller pieces, while using the other two-thirds independently for even more productivity. Developed and manufactured in CZECH REPUBLIC, ruggedly designed with attention to detail. 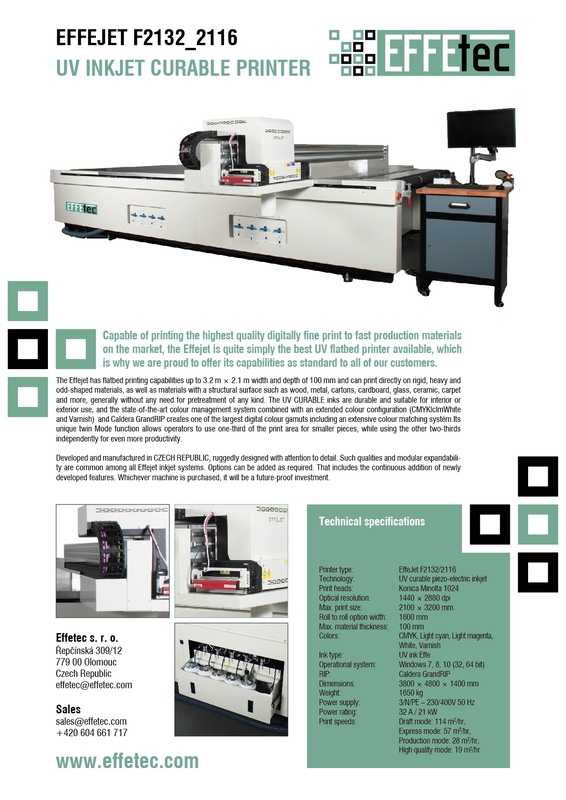 Such qualities and modular expandability are common among all Effejet inkjet systems. Options can be added as required. That includes the continuous addition of newly developed features. Whichever machine is purchased, it will be a future-proof investment.